Louise Cain was born September 15, 1926 in Versailles, Missouri and departed this life on October 25, 2018 at the Pleasant Hill Health and Rehabilitation Center in Pleasant Hill, Missouri at the age of 92 years, 1 month and 10 days. She was the daughter of Frank and Ethel (Brown) Terry. Louise spent her younger years in Versailles, Missouri. When she was 15 years old she moved to the Kansas City area to live with her sister. Later she moved to Arizona for a few years before returning to Missouri and making her home in Blue Springs. 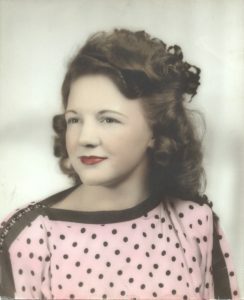 Louise worked as a waitress most of her life in various restaurants in the Kansas City area. Louise was preceded in death by her parents, Frank and Ethel Terry; two brothers and three sisters. She is survived by two sons, Mike Wimmer and wife Leona of Blue Springs, Missouri, and Mark Cain; four brothers, G. L. Terry, Donald Terry, Larry Terry and Day Terry; one sister Shirley Fockler; two Grandchildren and three Great- Grandchildren, other relatives and friends. Cremation was accorded and private family services were held at the Wallace Funeral Home on Friday, November 9, 2018. Although I didn’t know Louise all that well, I enjoyed visiting with her from time to time. She had a love for our Lord that we talked about, and she was ready to see Him face to face. Sympathy is sent to Louise’s family at this time.